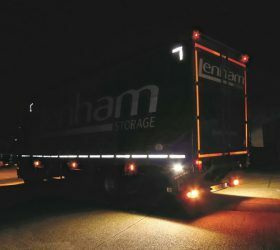 Lenham Storage, the ambient grocery and beverage Warehousing and Distribution specialists, reports a reduction in minor accidents since fitting high-intensity manoeuvring lights to vehicles in their UK distribution fleet. Each of the company’s 30 brand new rigid vehicles is equipped with Labcraft Banksman LED lights and trials have been successfully completed on a number of 10.8 metre urban curtain-sided trailers. One light is fitted either side of the rigids and trailers, positioned below the side raves behind the rearmost axle, giving light to the area most at risk while the vehicle is reversing. 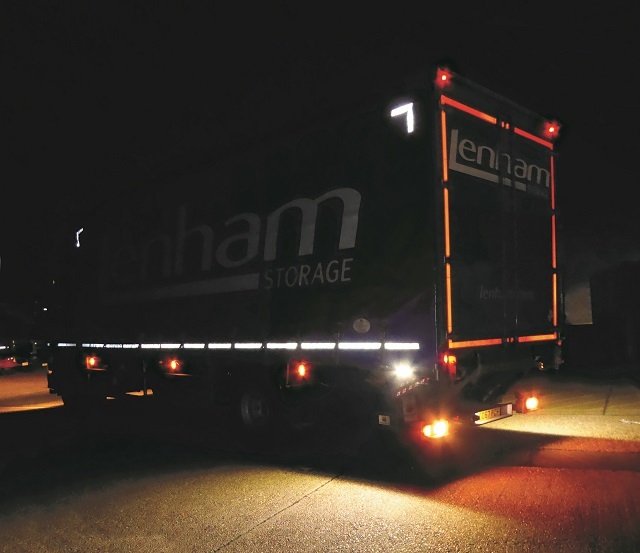 With around 200 vehicles in the fleet and as one of the UK’s leading grocery logistics experts, Lenham Storage is focused on reducing the risk of minor accidents when delivering to supermarkets and service stations, during the hours of darkness. The company worked with Labcraft to find the optimum solution and after extensive trials became one of the first operators to fit the Banksman system. Its high intensity LED light illuminates the ground in the surrounding area without projecting outwards into other lines of vision and comes on automatically when reverse gear is selected. Not only does Lenham Storage expect to see accidents and claims come down as a result of increased driver visibility but also, says the company, vehicle down-time and repair costs will be reduced. Lenham Storage is a family-owned and run business, and since 1946 has specialised in ambient grocery and FMCG storage and distribution. The company has over ¾ million square feet of shared-user warehousing, including 75,000 pallet spaces for racked or bulk stow storage.